Sonam Lakhani, founder of www.myhautelife.com, a fashion, travel and lifestyle blog based out of Dubai and Mumbai, has an inspiring transformational story to tell. What was your Transformation Duration? It took me about two years to get in shape completely, lose the fat and tone up. I never wanted to opt for any crash dieting methods or short cuts to lose weight. I loved my rice and I didn’t want to give up on the carbs at any cost. So when I realized I need to get rid off 20 – 30 kgs I started working out regularly, tried all different classes to see what I enjoy and what works best for me. I started eating home food but included rice in both my meals. I cut down on junk, sugar and switched to basic regular meals. Within three months I started seeing changes in my body and that motivated me even more. After a year I had shed off quite a lot of weight but had I still had to tone up so I started kickboxing and power yoga. That completely changed my body, I built muscle and started looking leaner. The process wasn’t easy but it was absolutely worth it. Since I was young and didn’t have anyone to guide me it took a little longer but with a help of a right nutritionist and a good workout you can speed up the process. I am a dreamer, traveller and a fashion enthusiast. I am also the founder of www.myhautelife.com, a fashion and lifestyle blog featuring latest style trends, beauty tutorials and some exotic travel locations. For me the best stories are found in between the pages of a passport. What motivated you to start the blog My Haute Life? My Haute Life is a celebration of all things I love Fashion, Lifestyle & Travel. For me, playing dress up began at the age of five and probably never ended. This passion grew further and as an extension, I dabbled with Jewellery Designing, Gemology and Diamond Grading. But at heart, I was always a fashion enthusiast. Clothes over stones, always!!! Realizing my vocation was meant to be in the design scene I fully immersed myself into the fashion world. I designed my own clothing brand and expanded my production; well that’s where the Business Graduation came in handy. After moving to Dubai I worked with ITP Publishing, Middle East’s leading publishing company. Along with working for the lifestyle section of Masala, I also took the mammoth task of styling several projects including the Masala’s Most Stylish supplement. It was this love that laid the genesis of my blog. Drawing inspiration from all parts of life and experimenting with my personal style, I want to recreate unique looks that are wearable and affordable. Also I’m so enamored with the idea of travelling to exotic locations. There’s something so enticing about exploring unique places and beautiful towns that people have only dreamt of. From living in an Igloo in Finland and spotting the Aurora Borealis in the North Pole to skydiving in New Zealand and chilling in BoraBora, I’ve done it all. Nothing makes me happier than exploring the world and dressing up! How are you able to manage a healthy lifestyle while travelling the world? What is your workout like when travelling? I’ve invested a lot of time and energy into getting in shape and the one thing I am never going to let go off is my healthy lifestyle. So when I travel I make sure that I am super active, I prefer walking everywhere, I try and drink more water, I eat a small snack every two hours, I refrain from eating bread and stick to fish, rice and vegetables as much as possible. I avoid flour and sugar as it tends to bloat me up. If I am going to a resort then I make sure to carry my gym gear and I swim as well. If it’s a city break then that involves a lot of walking and being active. What is your typical diet in a day? I start my morning with a banana and black coffee and finish my workout. My breakfast is usually poha/ idli/ eggs/ oats with almond milk. I eat an early lunch at 12.30pm which is mostly rice and vegetable (in any form) with a spoon of ghee. Two hours post lunch I have ginger lemon tea and a fruit. My evening snacks are usually dry fruits and one avocado along with green vegetable juice. Dinner is usually a fillet of white fish and lots of vegetables or a bowl of khichdi with ghee. If I crave for something sweet then I have dark chocolate or jaggery. What would be your weight loss tips for the bloggers who have to travel a lot and find it hard to maintain a healthy lifestyle? 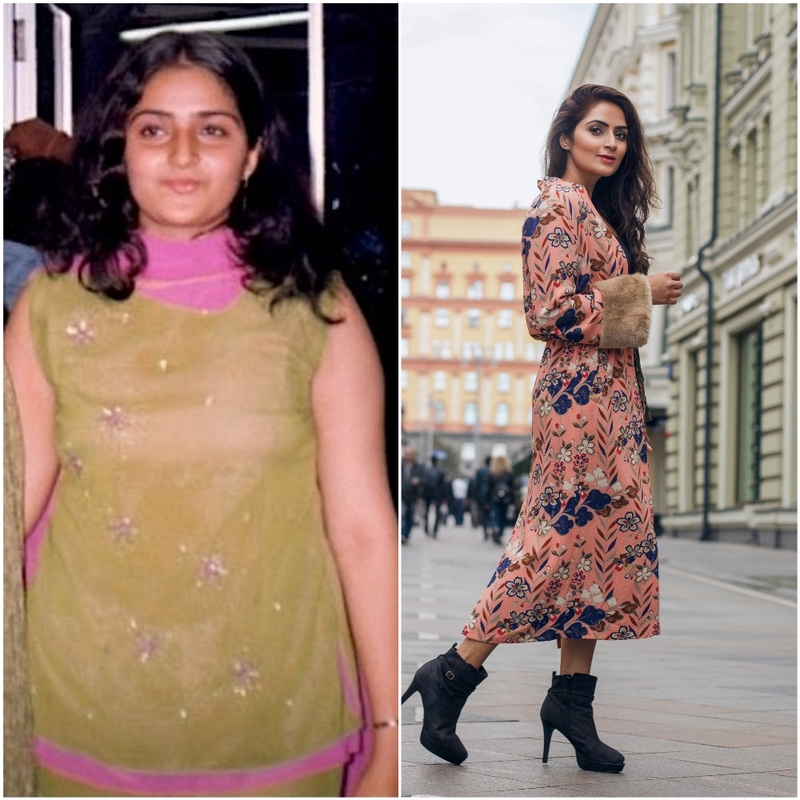 If Sonam’s story inspired you, click here to read more such spectacular weight loss stories!